Front turned feet with casters add a stylish design detail to this sectional sofa. English arms and T-style cushions offer classic style that also relaxed and comfortable. Dress it up in your choice of hundreds of custom fabric options and one of five wood finishes. The Brooke Sectional Sofa with Castered Turned by Robin Bruce at Thornton Furniture in the Bowling Green, Alvaton, Glasgow, Scottsville, Franklin area. Product availability may vary. Contact us for the most current availability on this product. Brooke-116 Right-Seated 3-Seat End 1 78" 37" 35"
Brooke-041 Large Armless 1 64" 37" 35"
Brooke-111 Left-Seated Chaise 1 32" 67" 35"
Frame Construction Frames are engineered not to warp, twist or split. Solid kiln-dried hardwoods, and wood laminates are used and the frame is backed it with a limited lifetime warranty. Joints are held solid with mortise and tenon or double-dowel and corner-block construction. Seat Support A heavy gauge steel spring system provides the base for a wonderfully comfortable and long-lasting seat. Springs are placed to provide for uniform, supported comfort and doubled up on each end to withstand the wear and tear that comes from everyday use. Padding & Ergonomics Since this is mostly a matter of personal taste, several cushion options are available. All feature a high resiliency foam core. The Susan cushion is the firmest. The Lisa, with its feather, down and regenerated polyester fiber blend, is "in the middle". And the Katie, with its very dense blend of only feather & down is, well...out of this world. Ask your sales associate for details. Warranty At Robin Bruce, we proudly stand behind the quality of our products. Handcrafted in the USA, each piece is constructed from the best materials and guaranteed to be free from manufacturer defects for its lifetime. Lifetime Limited Warranty - Frames, Springs, and Mechanisms. 5-Year Limited Warranty - Sleeper Mechanisms and Swivel chair/Rocker Mechanisms. 3-Year Limited Warranty on Innerspring and Cloud Contour Mattresses. 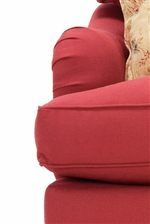 5-Year Lifetime Warranty — Seat Cushion Cores. Exquisite in style and quality, the Brooke collection gives you the option to customize your decor to fit your tastes. Handcrafted in the USA, each piece is constructed from the best materials for luxurious comfort and durability. 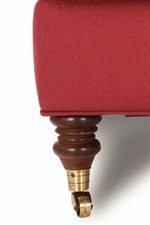 English arms and turned feet on casters present transitional details. Pick your choice of fabric to complete your piece for your own vintage or modern creation. The Brooke collection is a great option if you are looking for Transitional furniture in the Bowling Green, Alvaton, Glasgow, Scottsville, Franklin area. Browse other items in the Brooke collection from Thornton Furniture in the Bowling Green, Alvaton, Glasgow, Scottsville, Franklin area.